The happy team - click on the image for more detail. the image for more detail. 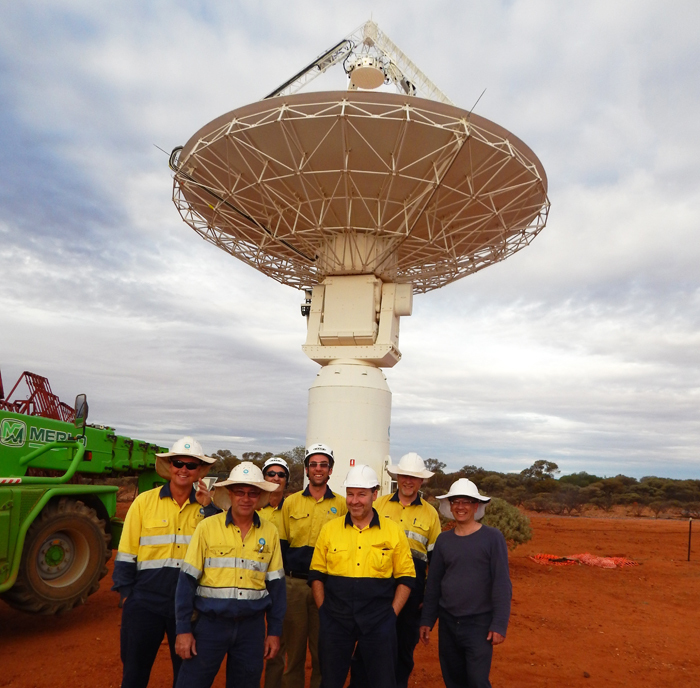 The first full-size second generation (Mk II) phased array feed receiver was lifted on to ASKAP Antenna 29 at the Murchison Radio-astronomy Observatory yesterday, marking a new milestone in the development of CSIRO’s Australian SKA Pathfinder telescope. 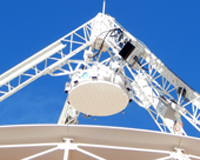 The development of the second generation PAF system builds on many of the lessons learnt with the design, development, construction and testing of the Mk I receiver. 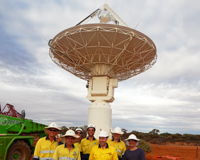 Six Mk I PAFs and their associated electronics, were installed on ASKAP antennas in 2013 and are already producing early science results. The development of the Mk II PAF system has advanced through a design optimisation program focused on operational enhancement through the use of new technologies and assembly techniques. The design of the Mk II now also incorporates novel components and assembly techniques such as the use of marine composites technology in the PAF casing to manage structural loading, thermal insulation, environmental protection and RFI shielding, as well as specially-designed groundplanes that ensure a low and stable operating temperature for increased system reliability. 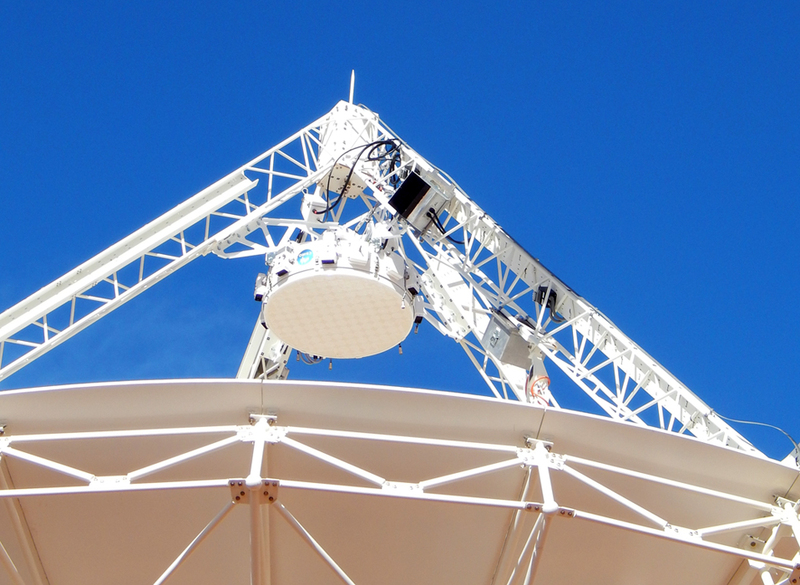 The installation has quickly followed the recent preliminary ground-based aperture array tests on the Mk II PAF, which yielded promising system temperature results, confirming the overall system design. 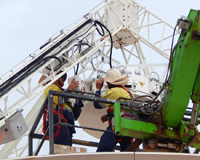 The next step in the process will be to repeat the system temperature tests on the Mk II PAF receiver while it is installed on the antenna. This will provide the team a reliable indication of the functionality of the system in the radio-quiet environment of the MRO. These results, along with the recent on-ground aperture array results, will enable the team to generate an assessment of system performance, and also fully characterise the operation of the Mk II PAF system. 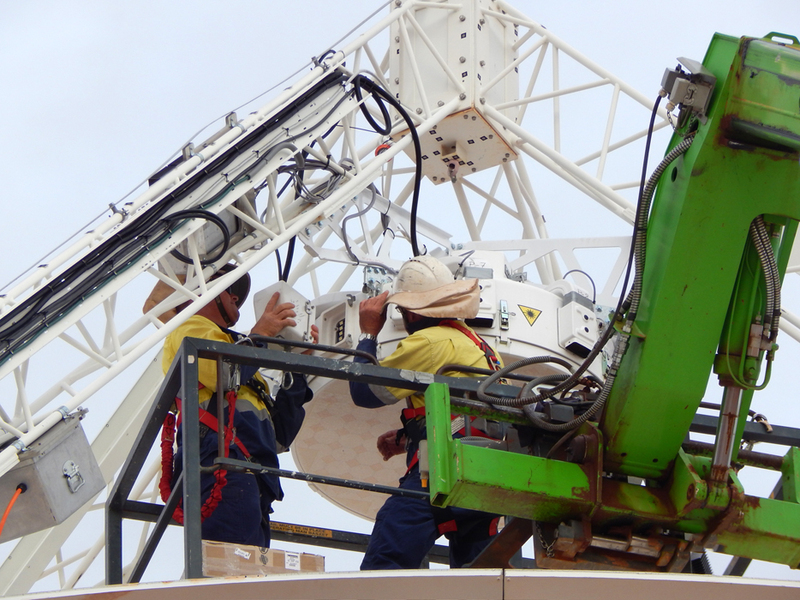 The Mk II PAF is currently installed on ASKAP Antenna 29 — to follow its progress tune in to the live MRO webcam.